See why more tax professionals trust Fast Forward Academy than any other EA review provider! We believe that great things happen when people work together. Connect with your peers instantly in our Online Community and discuss EA exam topics, difficult questions, and strategies to pass. With just a click, you can join the conversation from anywhere in the course and get the answers you need, when you need them. Substantial research went into our Enrolled Agent study guide to ensure that it contains all the important topics that will most likely appear on your exam. You won't find a more efficient book for this exam. We have the most popular Enrolled Agent study guide for a reason—our students pass in less time. It really is that simple. The intelligent textbook is your online Enrolled Agent Study Guide loaded with advanced features. Easily bookmark sections for review, highlight important information, take notes, and create digital flashcards right from the pages of your textbook. It even uses your performance to guide your final review before the real exam, so you don't waste time studying the things you already know. Get complete control of over 3,500 Enrolled Agent exam questions with explanations. 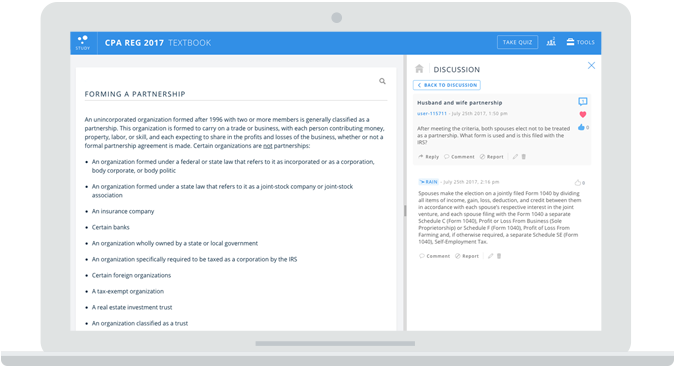 In addition to the standard chapter, topic, and subject filters, you can review incorrect answers from prior study sessions, or use innovative features like our FastFocus review to see the questions that will help you the most. With custom explanations for every EA exam question, you can see why an answer is right or wrong. But what about those times when you need additional help during your review? What happens then? With a single click, you can communicate with an instructor quickly, when you need it most. Our content specialists have helped thousands of future enrolled agents on their way to exam success. Access 10 hours of engaging video lectures covering the key concepts you need to know to pass the Enrolled Agent Exam. Dive deep into the specific areas that give you trouble with over 45 concise lessons that bring complex topics to life with real-world examples.